February 22, 2019 10 – 11:30 a.m.
***Due to an emergency repair, RG&E had to interrupt power to all of the Nazareth Campus Thursday evening. 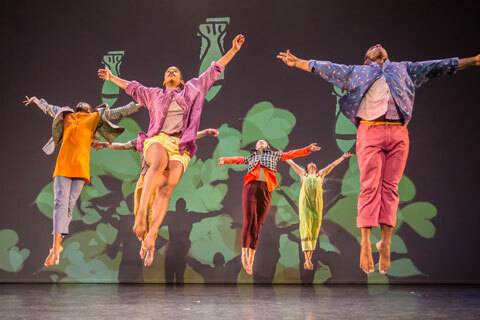 As a result, the performance of David Dorfman Dance was rescheduled for Friday, February 22 at 10 a.m.
All tickets for the Thursday, 7:30 p.m. performance will be honored at the Friday morning performance. Winner of eight New York Dance and Performance (Bessie) Awards, David Dorfman and his energetic ensemble explore self and society through hyper-athletic works that are “big-hearted, idea driven, smart and shaggy” (Arts Journal). Through movement, music, and monologues, Aroundtown explores the meaning of love in times of violence and strife. The company’s trademark empathy, sly humor, and bombastic physicality are harnessed to examine love as both sociopolitical and intimate weather systems. Presented in collaboration with the program of dance and movement at the University of Rochester, the Arts Center is proud to present this cutting-edge ensemble who “keeps alive the gospel of humanity, theatricality and good ol’ soul” (City Beat Cincinnati). Presented in collaboration with the program of dance and movement at the University of Rochester. There will be a post-show talk with David Dorfman and the company following this performance. Easter Mass 7 – 8 p.m.
Catholic Mass 7 – 8 p.m.
Open Gym 8 p.m. – 12 a.m.